Congratulations also on being a Graduate. The years have paid off ... you are now here. You have come to the right place to help you prepare for this auspicious occasion and memorable moment for you. Do you feel burdened by this task? A little queezy in the stomach ... ? Want to calm your nerves? This is why this site is here. What is a Valedictorian or Graduation Speech? Let's define this first, as this will assist in identifying what should make up such a speech. colleges or seminaries by one of the graduating class. 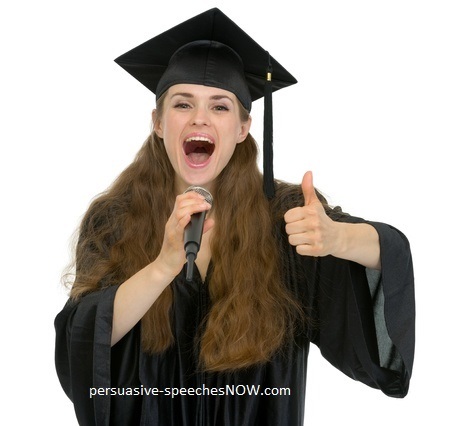 A graduation speech (or what could be called a valedictory speech) is an inspirational and persuasive speech to your audience. The AIM is to thank, exalt, stimulate to action, motivate your audience, to affect and touch, even to raise to a higher emotional level, and finally to say farewell. This is quite a role for a graduation speech to play, would you agree? How can such a speech be constructed or structured? Why would you structure your Graduation Speech? Structuring allows your audience to follow the path that you are creating, and also to understand where you are going. Repetition also assists your audience to follow you. There is nothing worse than an audience that is lost!! It's like planning a journey. You don't just set out, you work out where your destination will be, and the roads and stops to get you there. You create a map. This map will be shared with your audience in your introduction. You will tell them where they are going. So how do you structure? Yes it's as simple as IBC. Of course if you disagree, then see the link below for someone who can write this speech for you. Yes, you too can have a speech writer in the wings, resulting in an excellent speech for you. 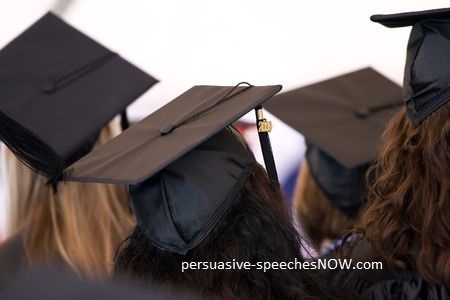 Come back to us here at SpeechesNow to help you with presenting your graduation speech, and to find all the tips and secrets to a delivery with no slip-ups! Good you are continuing with me ... here we go .. This page concentrates on your Graduation Speech. There are other areas on this site that will aid the construction of your speech. Such questions as "Who is your audience? ", "How to create word pictures" or "Considerations beyond your words" and "Powerful delivery secrets". All these and more will assist in the writing of your speech. After you have considered the following structure, check out the links at the bottom of this page. As a Graduate, you are part of a group or cohort that has shared significant achievements, and events together. Some of these could have been life changing. > Reflect on the past years and draw out some of these events. > Get together in a group and Brainstorm your memories. Now consider the Speech Outline below. This outline is in three parts. This conforms to the “Rule of 3’s” that is a powerful instrument in speech-making. three part Body, is a tried and true approach that brings success and is easy to remember. It also has the bonus of being easy for the audience to follow, and THIS is important. If appropriate, commence with an attention grabbing quote or image - perhaps a word picture. State the value you place on this opportunity to speak on this occasion. Identify your goal for this speech, or your IMPORTANT overarching concept that your speech will reinforce through the following three points. Summarise the points to be covered in your speech. Remember the map analogy above? This is where you briefly tell your audience where they will be traveling with you. Consider the ACCOMPLISHMENTS of this group of graduates. Consider the POINT to be made here that will summarise all that you would say in Point #1 PAST. "We are here today/tonight .... to celebrate the accomplishments ... "
"The end of a very significant phase in life ... "
"The beginning of the next most important phase of a new life outside of school ... "
Consider the POINT to be made here that will summarise all that you would say in Point #2 PRESENT. Consider this moment (today/tonight), this point in time.
" ... means we have the skills to learn, aptitude to succeed, abilities and creativity to make a difference, to work to meet the needs and assist in solving of the problems that face society ... "
Consider the POINT to be made here that will summarise all that you would say in Point #3 FUTURE. Summarise your three key points in the Past, Present, Future of the Body. Return to the Introduction. Restate your original statement or goal, for example it may have been “this school has taught us the elements of character that enable success”. Can you see yourself delivering your speech? SO THERE YOU HAVE IT ... a structure and outline to make building your speech easy. If you feel it is difficult or daunting then please consider your speechwriter, who will gladly write a speech for you. Speeches written for your graduation. Are you anxious about your Speech? I use music to calm me whilst I am preparing my speeches and before the big occasion. Have a look here at the music I use which is specially written by a gifted composer who understands.